A stay at Quality Inn places you in the heart of Clarion, and within a 10-minute drive of Clarion University. Featured amenities include complimentary wired Internet access, a 24-hour business center, and complimentary newspapers in the lobby. Free self parking is available onsite. 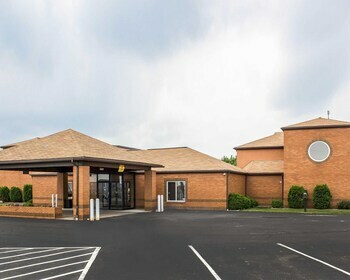 When you stay at Mayfield Inn Clarion in Clarion, you'll be next to a golf course and 8 minutes by car from Clarion University. Free self parking is available onsite. With a stay at Inn at Deer Creek Winery in Shippenville, you'll be 9.6 mi (15.5 km) from Clarion University and 17.1 mi (27.6 km) from Cranberry Mall. Free self parking is available onsite.